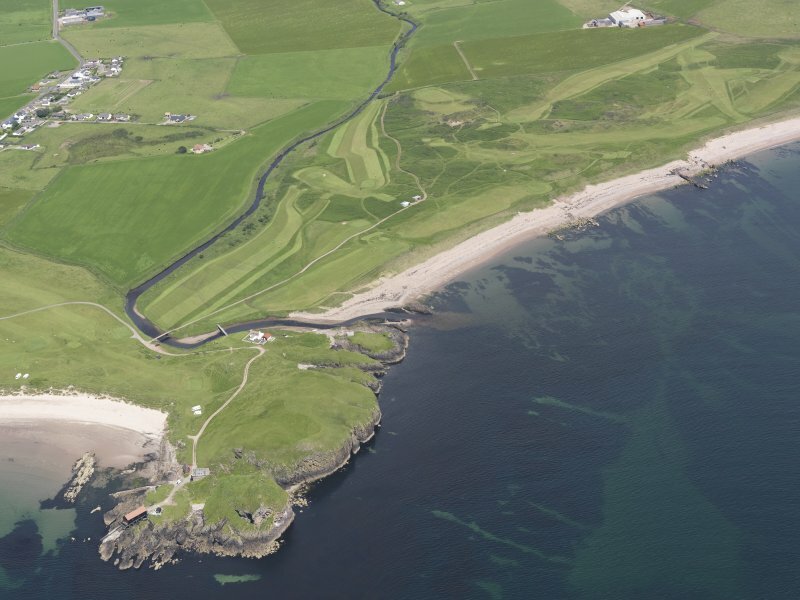 Oblique aerial view of Dunaverty Golf Course, Southend and Brunerican Bay, looking NNE. 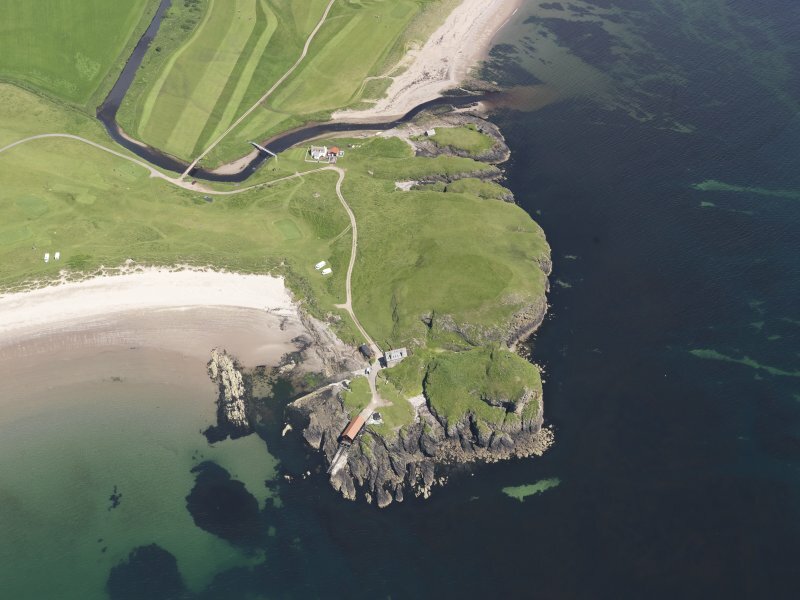 General oblique aerial view of the remains of Dunaverty Castle with the golf course adjacent, taken from the SSE. 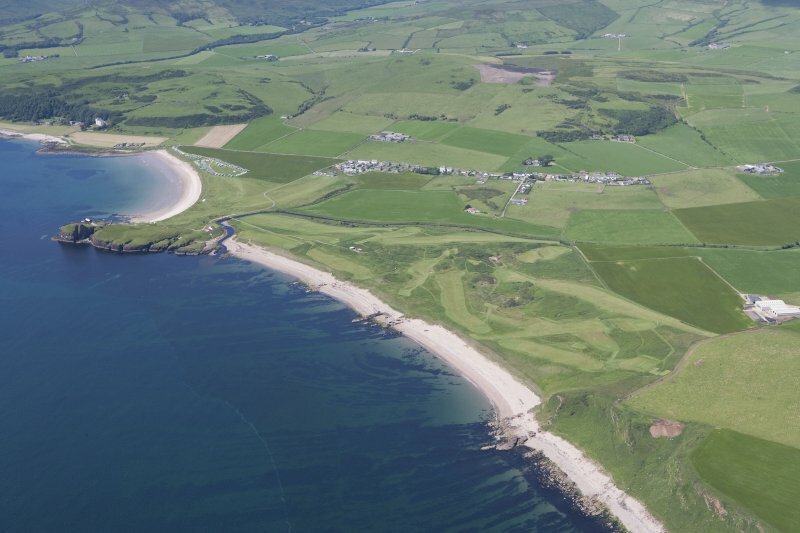 Oblique aerial view of Dunaverty Golf Course, Southend and Brunerican Bay, looking NE. 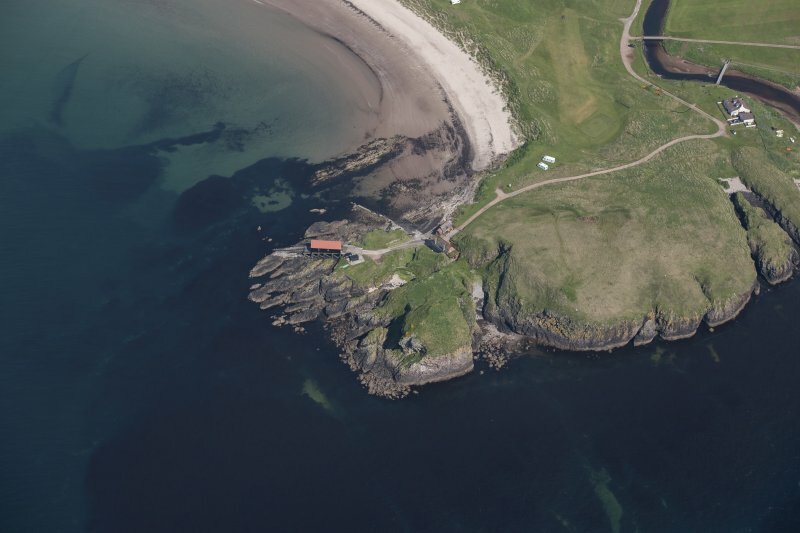 Dunaverty Castle. General view of ruin from West. 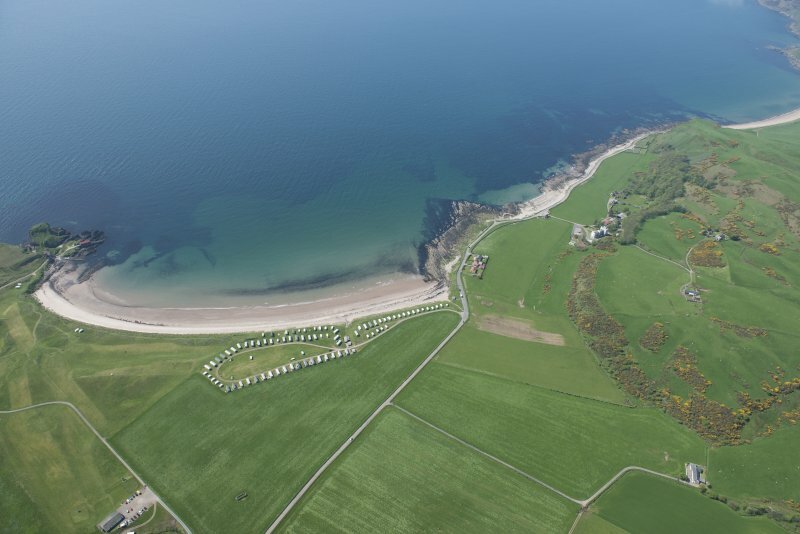 General oblique aerial view of Dunaverty Golf Course, Southend and Brunerican Bay, looking NW. 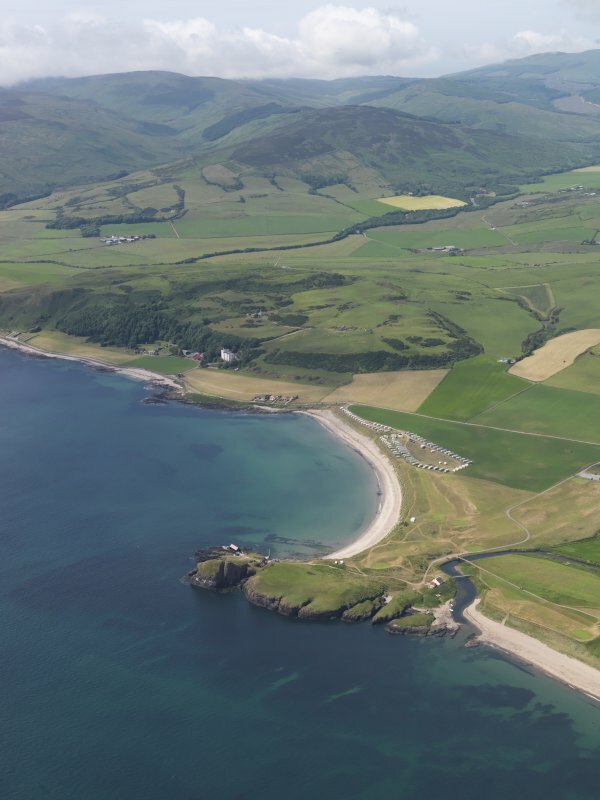 General oblique aerial view looking across the remains of the fort at Cnoc Araich towards the remains of Dunaverty Castle in the distance, taken from the N.
General oblique aerial view of the remains of Dunaverty Castle with the golf course adjacent, taken from the ESE. 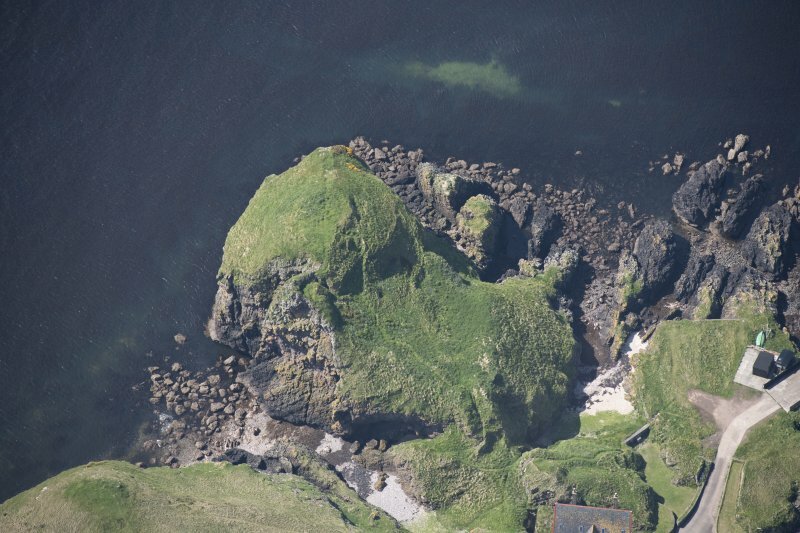 Dunaverty Castle. 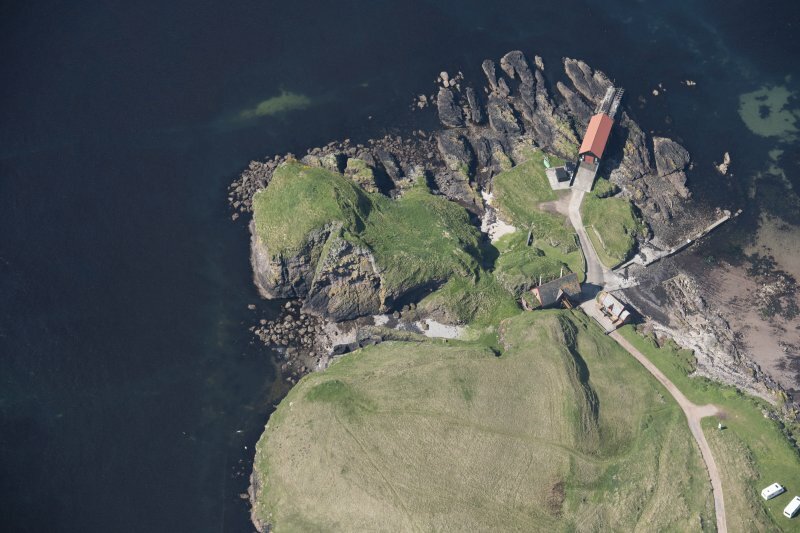 The scanty remains of this castle occupy a conspicuous headland of conglomerate rock which projects into the Sound of Sanda between Dunaverty Bay and Brunerican Bay. 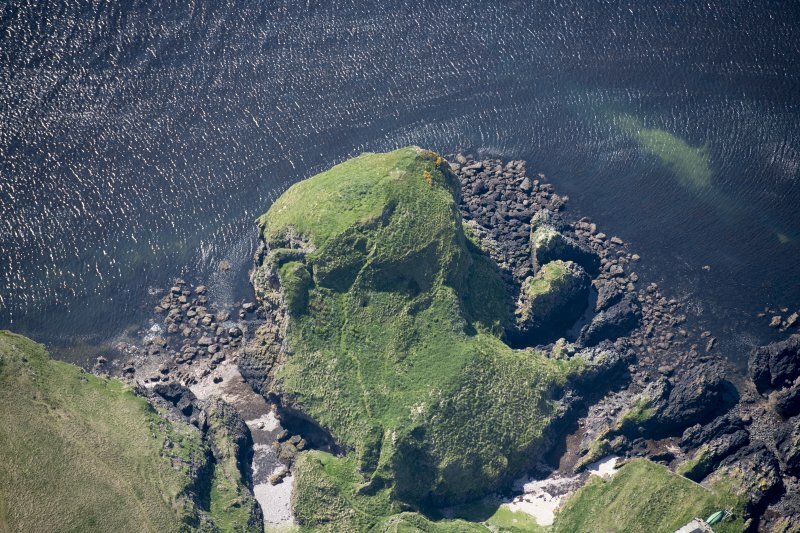 The headland forms a natural stonghold, being sea-girt on three sides and approachable only from the N, where a narrow path links it to the mainland. The principal means of defence appears to have been a wall of enclosure whose course was dictated by the configuration of the site, but it is possible that those sections of the perimeter that appeared naturally impregnable were left undefended. 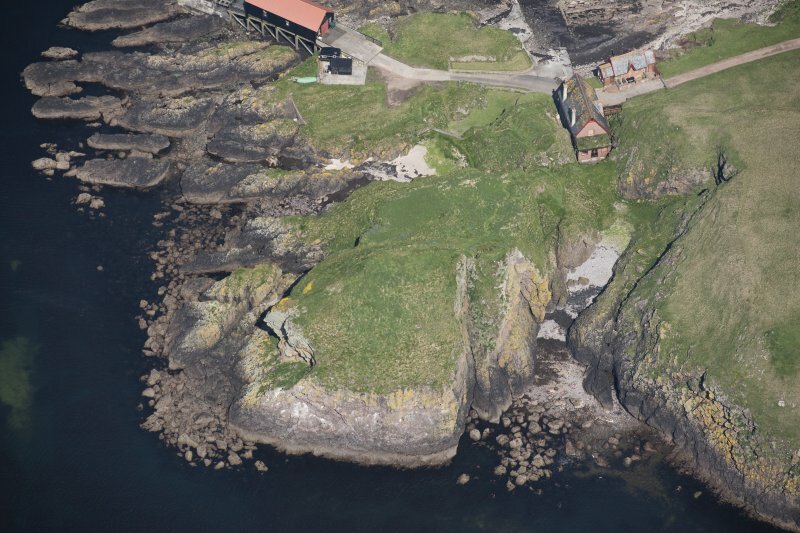 Thus, few traces of masonry can be seen on the E and S sides of the headland, where there is a precipitous drop to the sea, but close to the SW tip of the promontory there is a short section of wall evidently designed to seal off a possible line of ascent in this quarter. 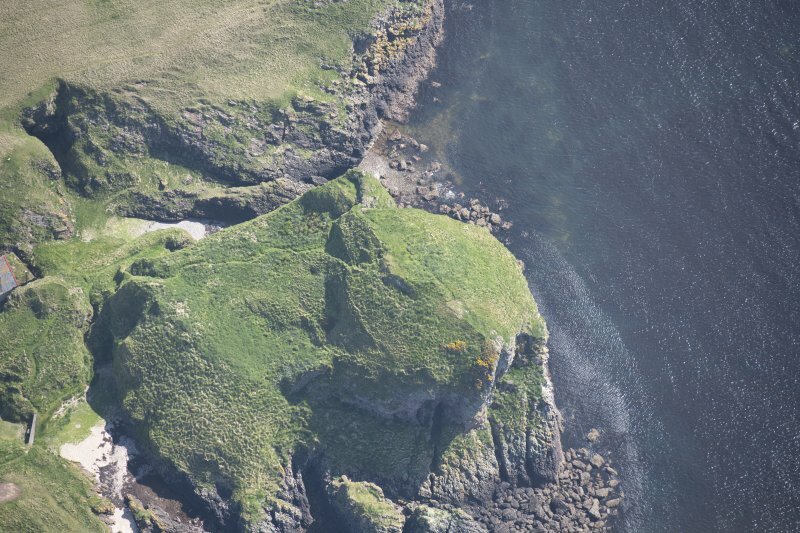 Further fragments of curtain wall may be seen along the NW perimeter, enclosing a fairly level platform which lies below the summit on this side of the headland. Towards the SE side of this platform a small circular rock-cut depression (A on plan) may represent the site of a well. All the surviving fragments of curtain wall are of roughly-coursed rubble masonry laid in lime mortar; the best preserved section appears to have had a thickness of at least 1.5m and a height of more than 3.4m. The summit itself, although comparatively level, is quite small in area. 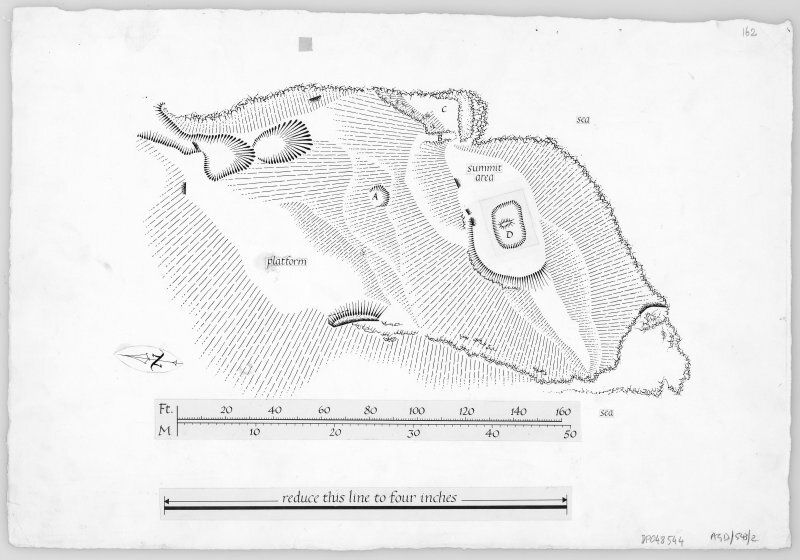 Access was evidently gained to it from the NW platform by means of a narrow, roughly-formed, rock-cut staircase (B) which terminated in a small chamber (C) occupying the E extremity of the summit. This chamber was formed partly by quarrying, its E and S walls having been founded upon a rock sub- structure which is still preserved. There are no other identifiable remains of buildings upon the summit, except along the NW side, where there are fragmentary traces of a wall of enclosure. 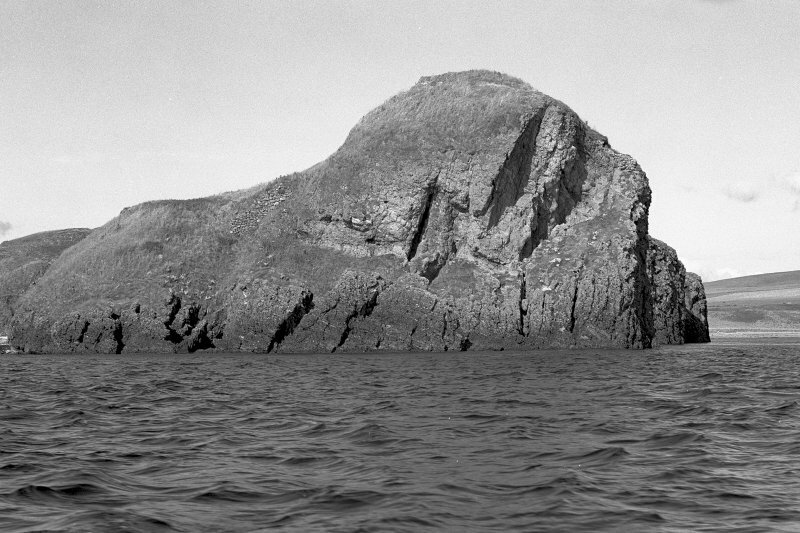 It is possible, however, that a subrectangular depresson (D) in the centre of the SW portion of the summit, measuring about 6.1m by 4.0m over all, represents the site of a former building. There is insufficiennt evidence to determine the precise age of the remains described above, but they may tentatively be ascribed to the medieval period. 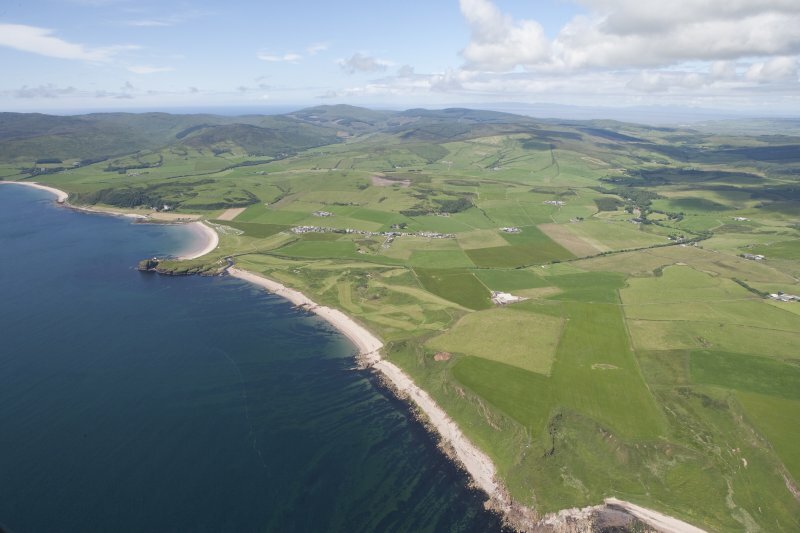 The fortress first comes on record at the beginning of the 8th century, when it formed a principal stronghold of the race of Gabran, grandson of Fergus of Dalriada. 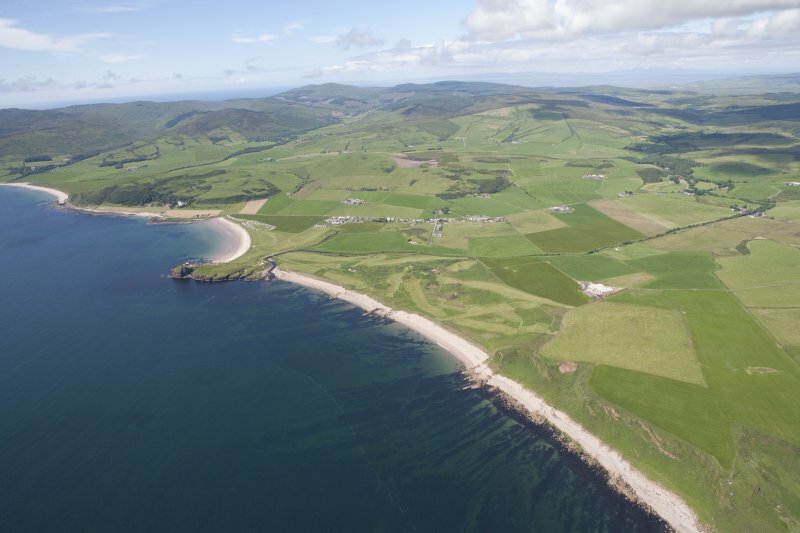 Dunaverty was seized by Scottish rebels with English help, and recovered by the Crown, in the 1240s. 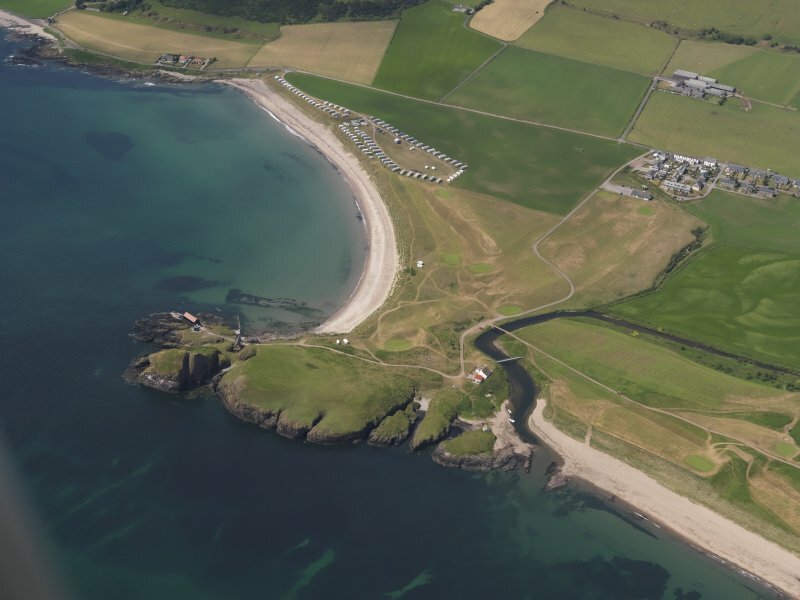 The most important event in the history of Dunaverty was General Leslie's siege and subsequent massacre of a royalist garrison under the command of Archibald MacDonald of Sanda in 1647. 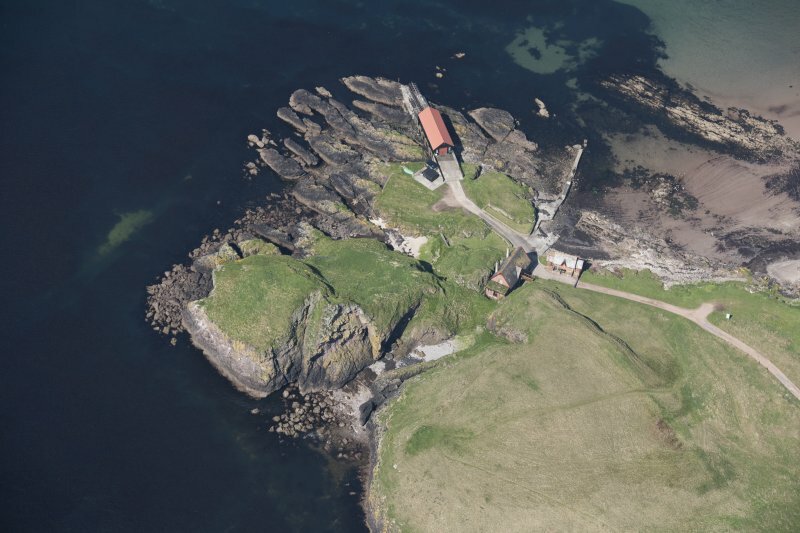 The castle was probably dismantled at the time of the Earl of Argyll's rebellion of 1685. 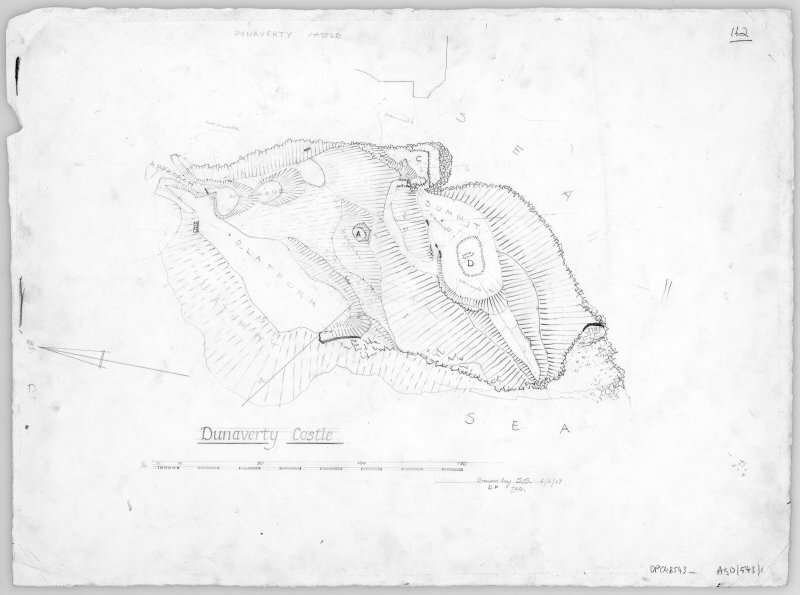 The remains of Dunaverty Castle are as described and planned by the RCAHMS. Visited by OS (NKB) 27 September 1977. 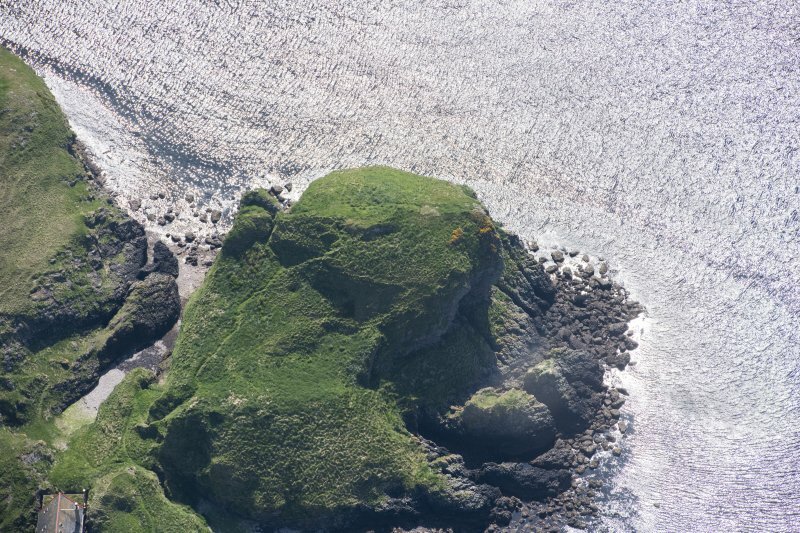 Nothing can be seen of what is assumed to have been an early medieval fortification on the site of the Dunaverty Castle, which stand on a precipitous headland flanking the E side of Dunaverty Bay. The remains of the castle comprise traces of mortared masonry on the edge of the level summit area, which measures no more than 18m from ENE to WSW by 9m transversely, a rough rock-cut staircase providing access to the summit on the ENE, and fragments of a curtain wall extending along a terrace commanding the neck of the craggy promontory on the N and blocking access elsewhere. 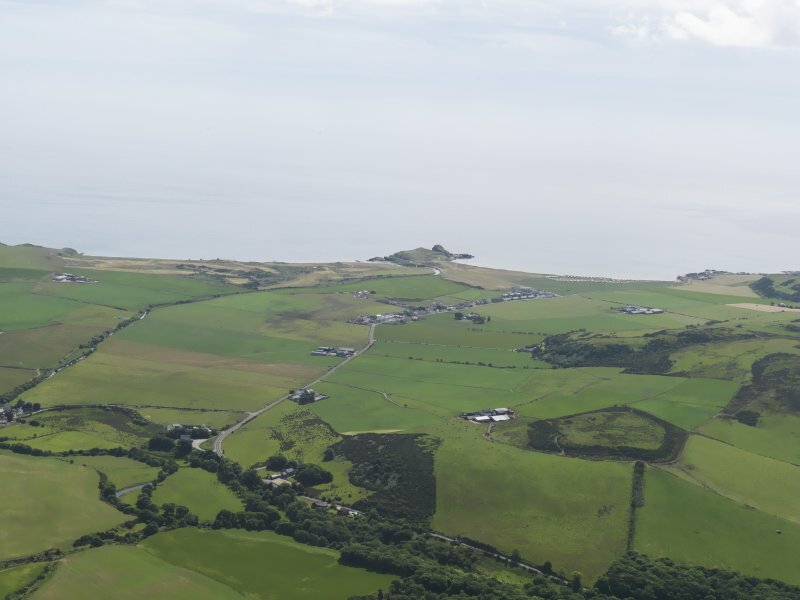 While any earlier fortification may simply have occupied the summit, it may equally have followed the line of the curtain wall on the N, thus cutting off an area measuring about 58m in length from N to S by 28m in breadth (0.12ha).